Wow! A panoramic with Chomrong clinging to the slope, Annapurna South (23,680′), Hinchiuli (21,132′), Machapuchare, and our tents! Today’s hike would take us from 10,670′ down to 6,759′ but descent is not the whole story. For in between there would be some of the hardest climbs done in a day on this trek. We’d end the day back at Chomrong – where’d we’d been a few days prior. But this time, we’d be climbing two of the longest sets of stairs instead of descending them! The day started cool and comfortable. It was partly cloudy, and I assumed the clouds would burn off, which they eventually did. Being a bit cooler was a real benefit. I used the drying technique again last night of sleeping with wet clothes in my sleeping bag – they were dry in the morning! After one of the break stops, I found myself starting behind the group because I was talking with another hiker when the group just took off. Yet I wasn’t the last guest, as somehow it turned out Madeleine was behind. Before I even knew she was behind I just happily walked my own way and tuned in to the sounds of the Modi Khola River, the breeze and the birds. It was only when I heard Mingma calling from behind that I knew they were there! Morning! Just look at the slopes up there. Amee with Machapuchare down the valley – we came from there! The most challenging steps of the day were our last. In mid afternoon, we rounded a bend to see across a valley to Chomrong. We’d climb steeply to cross the river via a suspension bridge, then ascend some 2,000 steps through the village to our lodge-side campsite. Once at the bottom of those steps, I dressed down to my T-shirt for the upcoming steps! After much industry I make it up to camp maybe 30 seconds or so behind the main group. And after making home in my tent, Don and I headed to the restaurant for an early beer. And headed back after tea time….and we were joined by Uli, Kevin, and Annette for a couple of well deserved beers! Waiting to dig into breakfast. The best views were in the morning. And those are featured on this blog post. 2018 has been a tough year. In February, I lost my brother John to cancer, after a two-and-a-half-year battle. But on the positive side, my friend Shari has come through a courageous struggle with breast cancer. I have watched and rooted, I’ve been lifted when they were on the mend and pained when the battle seemed for naught. I swear, cancer treatment often seems like witch doctor medicine. I was inspired by their courage to trek in a tutu Nepal’s Annapurna Region to raise funds for breast cancer prevention! Ever since I completed my first Himalayan trek, the Chomolhari Trek in Bhutan, I’ve been yearning to return to the greatest mountain range in the world, with its spectacular views, ultimate challenge hikes, and its myriad cultures and faiths. So it was that in 2018 I signed up for the Annapurna Sanctuary Trek led by Cathy Ann Taylor. I love travel, discovering new cultures and perspectives, and I am hopelessly hooked on the outdoors. So this trek was in my wheelhouse. But what was in my wheelhouse, just for other causes was fundraising. I’ve been part of a number of non-profits, even been on the board of directors. So it was a surprise when maybe six weeks prior to the beginning of this trek, it became a “sacred” trek, to raise funds for Breast Cancer Prevention Partners. 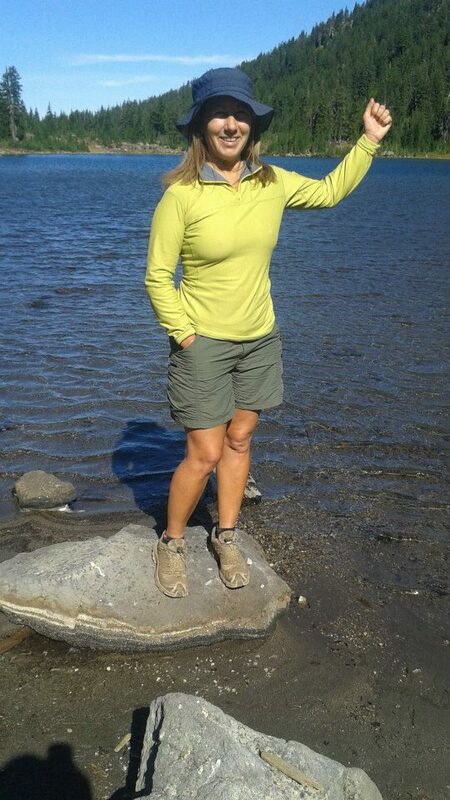 Cathy Ann named Joani Carpenter, a trekking peer from my Cordillara Huayhuash Trek as its honoree. Joani survived pancreatic cancer! My first reaction was OMG what have I signed up for? I’m already busy with fundraising! How can I add another? Then I found out fundraising was not a requirement. Still, over the subsequent days, I kept thinking about it. Then I was at KEEN Footwear in downtown Portland (one of my sponsors), and a heard a phone ring…I picked up the phone and the voice said, “Just do what you know how to do.” I heard a call to action! The next morning, I went to my gym, and as it was breast cancer awareness month. They had mannequins festooned with pink shirts, feather boas and tutus. As I did my abdominal routine a thought came to mind, “Trekking in a tutu!” And with that crazy idea in mind, I hatched a plan to raise funds by trekking in a tutu in honor of Joani, and of my friend Shari, who is a survivor, and in memory of my brother John. At first I went out and bought pink stuff. That was all I knew. I got pink bandanas, a pink boa, pink shirts. Shari made a pink tutu. I made a pink social media post. 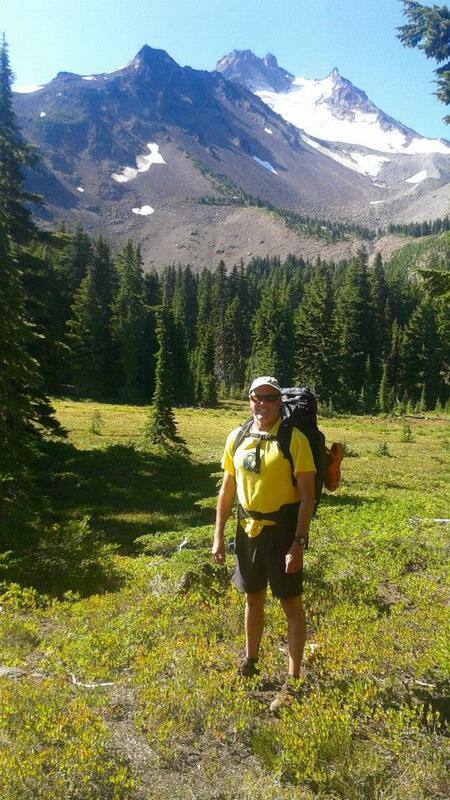 I figured trekking poles, muddy boots, prayer flags and hash tags might do the trick. Shari and I even did a small barbecue and a photo shoot! Then I learned the correct color is purple! Purple is the color for prevention. With only a week to go I got synthetic purple shirts and a purple bandana. If I got enough support, I’d get images of myself in that tutu in Nepal! I posted photos on social media, and sent personal ask letters. With just so little time I was surprised I was able to generate over a thousand dollars worth of contributions. And with that done, on trek, I needed to generate some content for the contributors! So, whilst in Nepal, I managed to get some images in that outfit, or wearing some of it! OK, yes, there will be following posts of this trek! We managed to ascend/descend tens of thousands of vertical feet, take in views of the world’s giant peaks, meet people from dozens of countries, and laugh a lot. We struggled up or down tens of thousands of steps. We ? Me? Sweated a lot. We ate like royalty. We witnessed giant peaks and glaciers. We said “Namaste” a thousand times! We witnessed priceless sunrises. We bumped and grinded in 4x4s. Siouxon Creek trail is one of the most beautiful places to hike near Vancouver, Washington. Located in a deep valley, it rarely gets hot even during summer heat waves. April, Tatsuro, Monica and I spent a perfect afternoon hiking there last weekend. Hiking Siouxon Creek leads you past flumes, towering moss-covered firs and maples, clear green pools and ends with a 45-foot waterfall. It’s about 4.3 miles to the waterfall, making for a full 8+ mile day. The trail continues past the waterfall. And you can connect with a trail leading to Huffman Peak, which would make for 14 miles total. There are perhaps ten backpacking campsites along this stretch. And on our hike it seemed most filled up. It would be a Lord of the Rings type experience, I think. I could imagine Orcs coming in the night – perhaps fighting with Cave Trolls. We had expected the area to be muddy because it had rained the day before. But we found only a few spots with mud. Completely delightful. The trail comes almost down to creek level, then climbs sometimes 40 feet above, whilst crossing tributaries. There are lots of small waterfalls and pools to glimpse. It might be tempting to jump in that water, but it was May. The temperature is probably 40 degrees! I have seen people swimming in the middle of summer here, though. Siouxon Creek is also popular for mountain biking. I originally discovered this trail through a mountain biking guidebook. On our hike this time we only saw two bikers. Although fast-hiking or fast-packing is trendy these days, I find sometimes going extra slow, or even pausing, yields beautiful rewards. This area is packed with life. But if you are rushing along, you’ll miss the wonder. There are countless species of plants. Every inch is occupied by a form of life competing for food and sunlight. Moss clinging to a maple. There were countless “nurse logs.” A nurse log is a fallen tree that has decomposed to the point that it becomes nutrients for new trees. We saw a toppled old-growth tree, with over 100 feet of new trees growing along it. The water is impossibly pure and clear. The rocks are gray, brown, rose, green, and speckled colors. In some places the water is so clear you cannot even see it. Our turnaround point on the hike was the 45-ft waterfall. Also a nice spot to stop for lunch. We lingered quite a while to soak up the tranquility. Then it was another refreshing hike back to the trailhead. A view from the trail on the canyon rim! Chaco Canyon is definitely the most significant example of ancient civilization in New Mexico, and probably the entire Southwest. I was uber excited to witness it! A United Nations World Heritage site, it is 11 miles long and 5 miles wide, and contains dozens of citadels each containing up to 800 rooms with up to 20 Kivas, or religious ceremonial centers. It’s also a nationally registered Dark Skies site. In Chaco, the stars seem an arms length away. Ancient Puebo peoples from numerous tribes congregated at Chaco for seasonal and spiritual celebrations. None of these cultures had written language, so what we know is from oral traditions, stories, passed down to their ancestors – today’s Hopi, Navajo, etc. 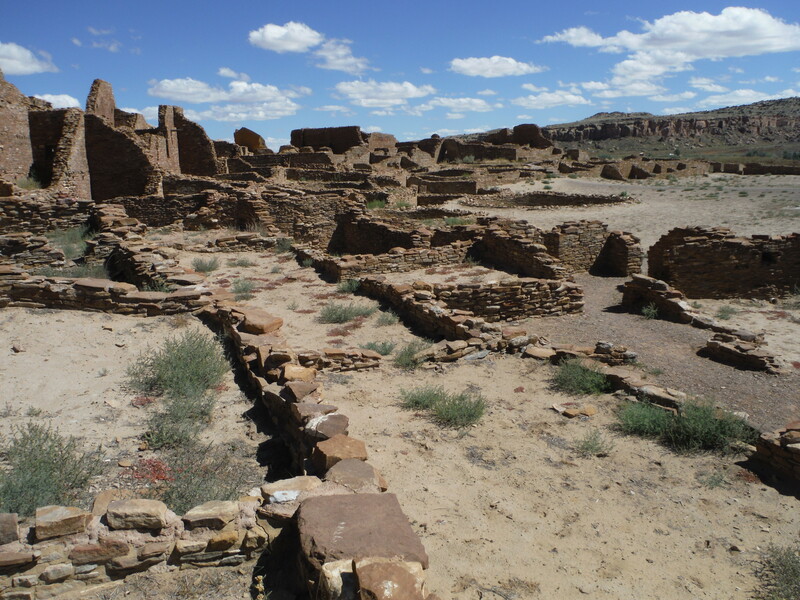 Anthropologists tell that Chaco was not a residential city. Although some people did live there temporarily to work on the buildings, they would eventually return to their villages many miles distant. Today’s SW Indian people see Chaco as an important waypoint on their tribal spiritual migration treks. Getting to Chaco is not for the faint of heart. While the site is a Federally managed area, with paved roads, the way there is fraught with challenges. The route passes through county, Federal, and tribal lands. It is 33 miles of paved, “maintained dirt,” and “unmaintained” road. It passes over dry river beds. While Chaco has campgrounds, there isn’t water within the park, except at the visitor center. Be prepared. Chaco is a network of citadels, known as Great Houses, aligned along auspicious astronomical and directional lines. Buildings may constructed to align with the solstice, and Kivas may be aligned north-south, for example. These were built on the valley floor but also up high on ridges. Signal fires were lit to communicate important information up and down the valley. Incredibly, geological features enabled voice communication across the valley! 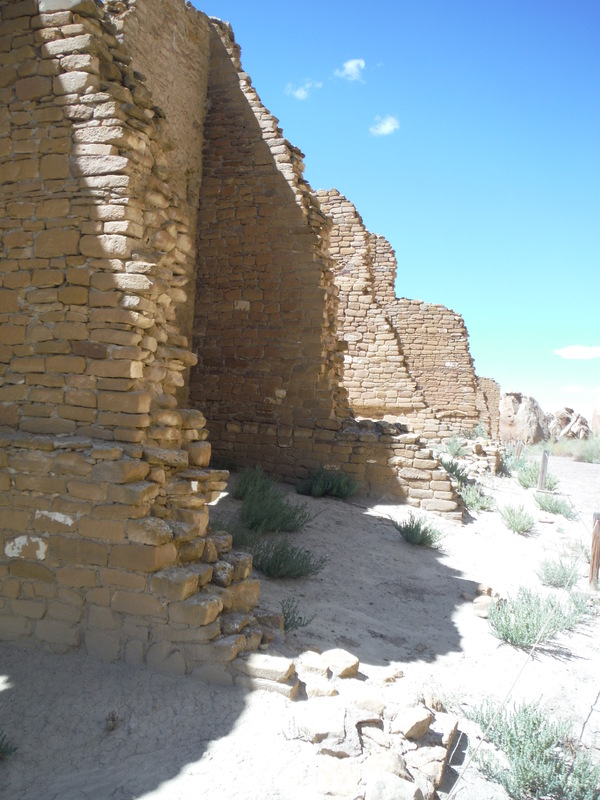 Building in Chaco is thought to have begun around A.D. 800, with the peak of construction about 1150. 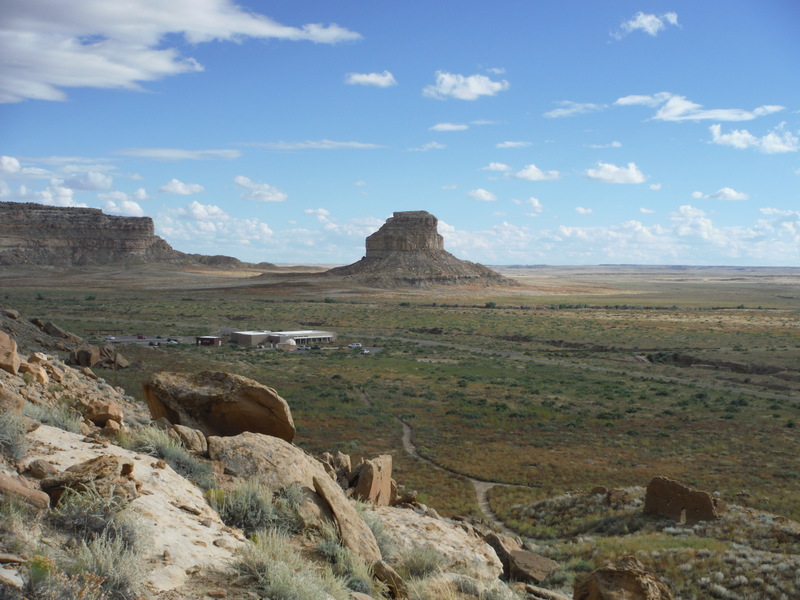 By 1050 Chaco was the center of influence in spiritual, economic and administrative matters for an area comprising SE Utah, SW Colorado, eastern Arizona and New Mexico. Advances in building technology is evident in the ruins. One of my favorite things to do in Chaco is taking a hike. Some of the hikes climb the canyon walls, leading to more trails and citadels up above! The view is incredible. But then you come across a ruin! We heard about the hike to Pueblo Alto, which is a complex on the canyon summit above. But how could we see it? The Ranger told us there is a trail leading up there. We drove out to Pueblo del Arroyo, where there is parking and a trailhead. A self-issue back country permit must be completed. We started the hike. Along the way, there are stakes indicating “trail.” Some of them are in unexpected places, like in rocks 10 or 15 feet above where I stood. So we just scrambled up to get to them. 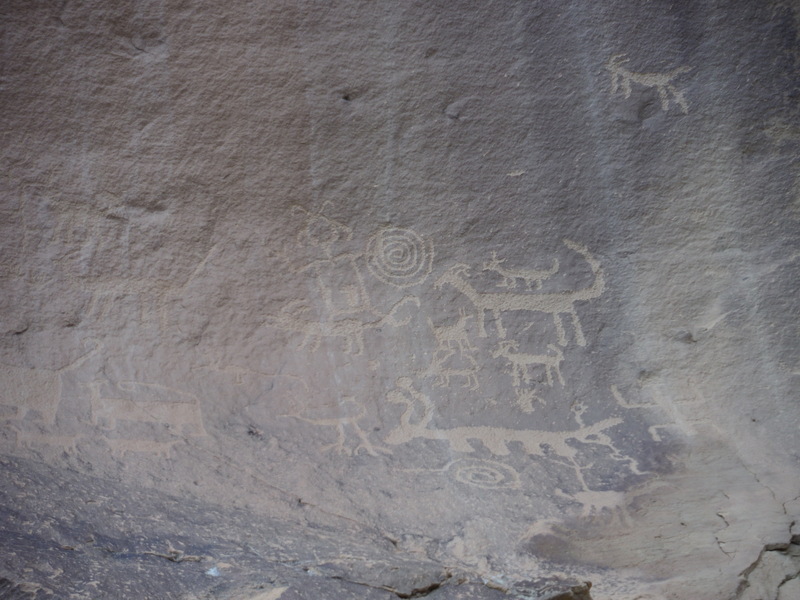 Along the scramble, we glimpsed a number of petroglyphs etched into the canyon walls. One can see many things illustrated. Like familiar creatures such as snakes, spiders, or elk. 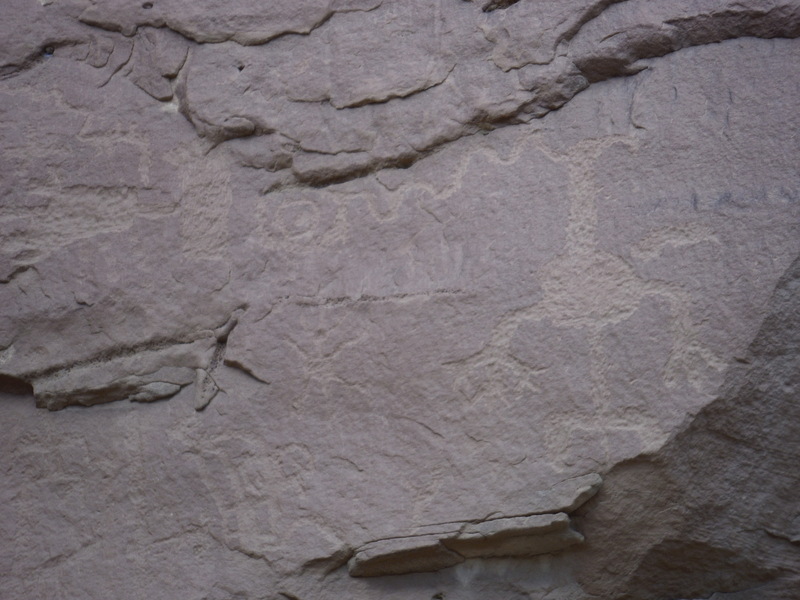 But other creatures gone from the canyon are depicted, like bighorn sheep. And spiritual entities are pictured. By far my highlight of the day was taking this hike above the valley floor. The trail wound its way amongst boulders. Then, the next “trail” stake was at the wall. I climbed up to it, and then, looking to my right, this “trail” seemed to climb up a crack in the valley wall to somewhere above. 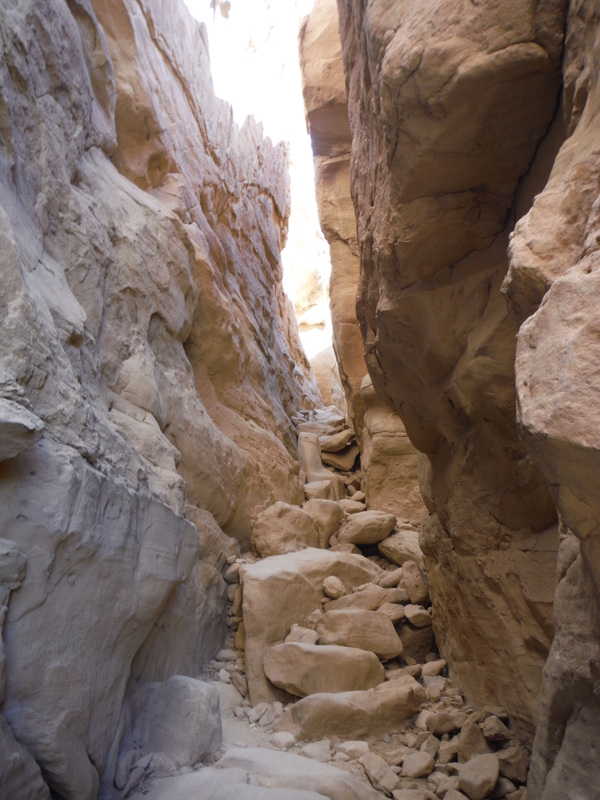 Scrambling up this slot leads to the top of the canyon, with a freaky beautiful trail up there! I was in the lead, with Tully behind. I thought, “Well, what the heck!” What I didn’t know was what awaited above. A careful stepping up the rocks led to the top of the canyon, where a relatively flat hike awaited – with an unlimited view! One up there my emotions went from nervous to ecstatic. There is a whole world up there, which ancients walked for a thousand years. 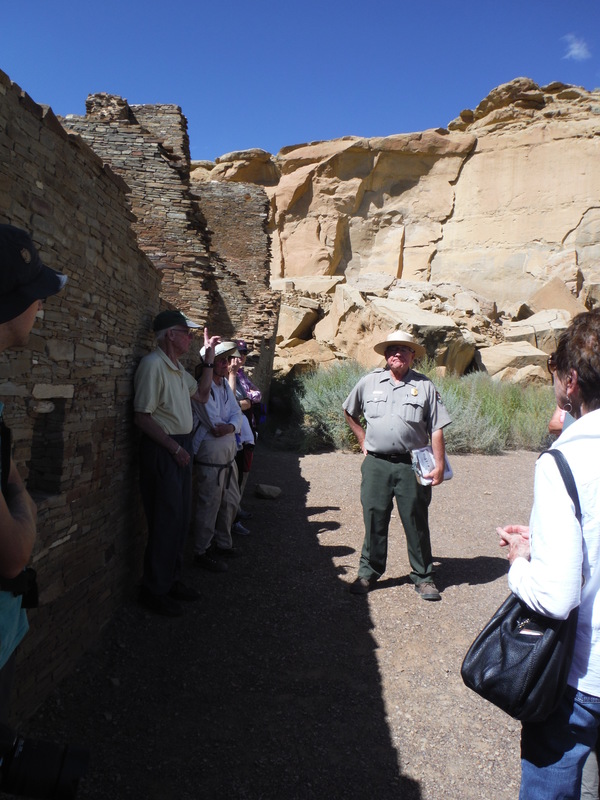 It is no wonder they held Chaco Canyon in spiritual reverence. Chaco has Rangers that give informational talks, and we took advantage. We spent one and a half days in Chaco. We stayed near Cuba, a town outside the entrance to the area. My recommendation is to camp in Chaco, if you are up for that. Spend two nights there. That way, you can walk the trails up to the high citadels. The base is 6,200ft. Take full advantage of the night skies opportunities. The Visitor Center has Dark Skies presentations – it has an observatory! I’d never been to New Mexico. So, when my friend Tully moved his family to Albuquerque and he offered to spend a week exploring, I jumped at the chance. We traveled north to Taos, and then west to Cuba, and then on to Grants. 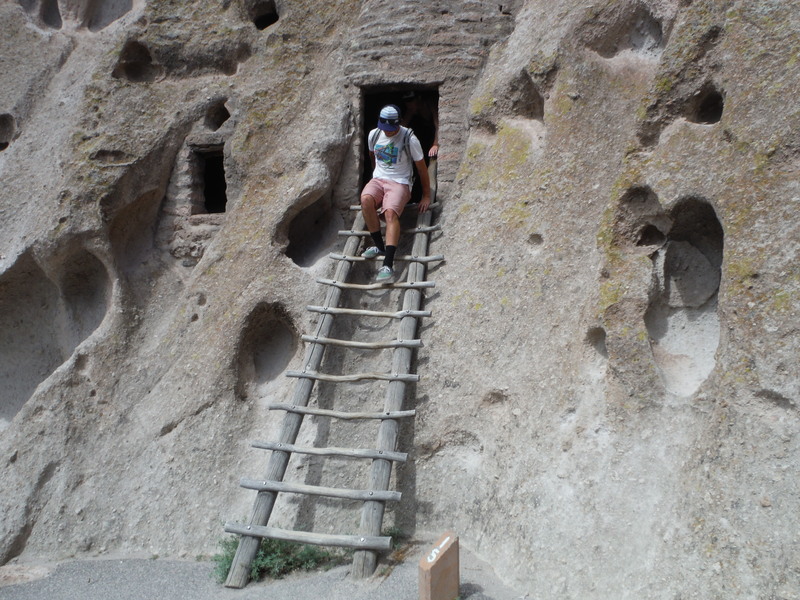 On day one, on the way to Taos, we spent the afternoon in Bandelier National Monument – where you can hike trails to Ancient Pueblo ruins on the Frijoles Canyon floor, and climb inside cliff dwellings! People have been living in the area for 10,000 years. 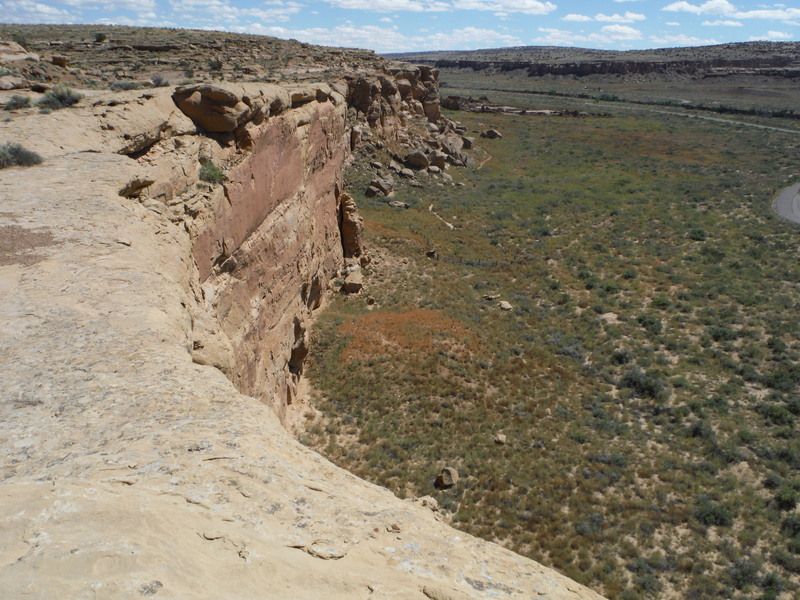 The earliest peoples followed prey animals in and out of the canyon on a seasonal basis. Later, agriculture was developed, and a more stationary lifestyle ensued. By 1200 AD, construction of 40-room “great houses,” and cliff dwellings was at its peak. All along the north valley wall there is evidence of many homes. The valley is north-south aligned, and the north wall gets precious warming sun – especially in winter. So all the homes are on the north side. Some are still standing today, and I walked amongst them, and climbed ladders to peek inside. There remains black soot on some of the ceilings from fires. The Ancestral Pueblo people did not use written language, so there is no written evidence of their culture, other than petroglyphs carved into the canyon walls. 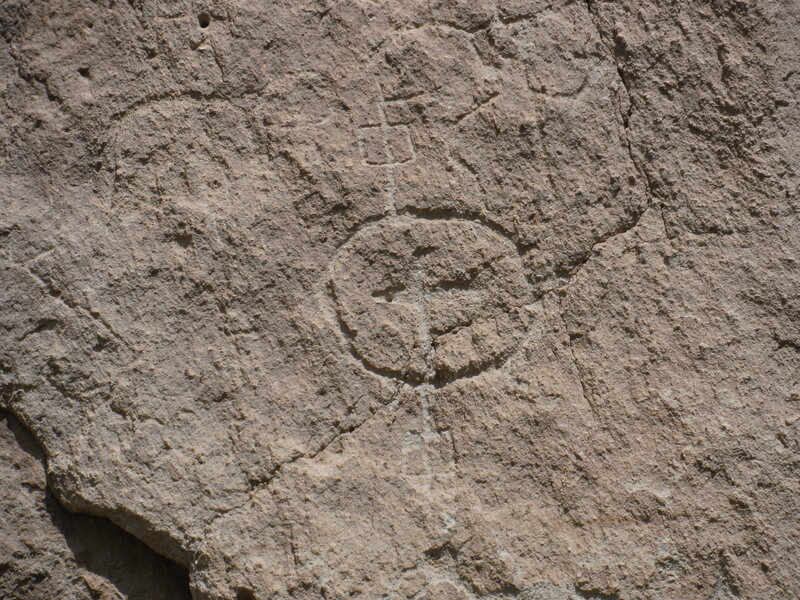 The petroglyphs depict Thunderbirds, parrots, bighorn sheep, snakes, and more. The Pueblo people carried on their stories, religion and traditions through singing and story-telling. Much of what we know comes from the oral tradition practiced by today’s Pueblo people. These people lived in villages spread out amongst New Mexico, SW Colorado, and Arizona. Archeologists have discovered 3,000 sites here, but these were not occupied at the same time. As time went on, people tended to gather in villages and plazas. The largest is Tyuonyi, which may have had 600 rooms. Special rooms for religious ceremonies are called Kivas. 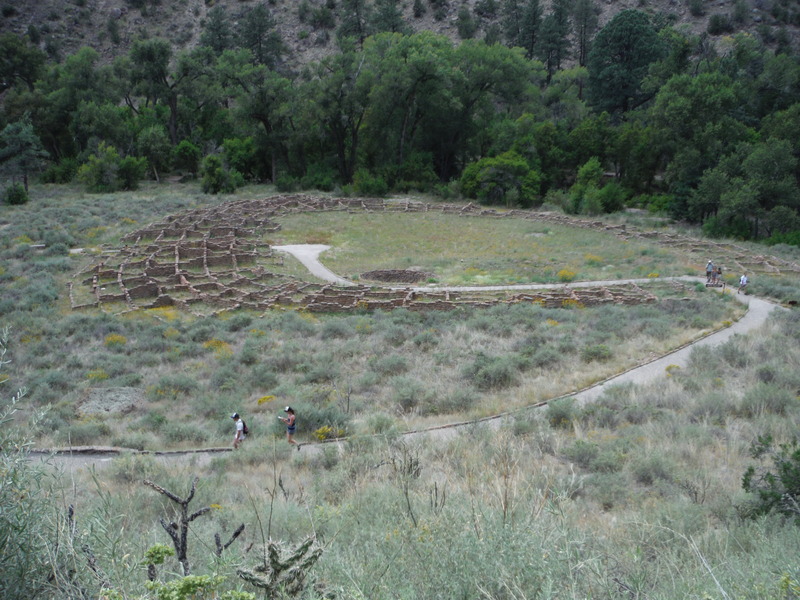 Kivas are built into the ground and are round. 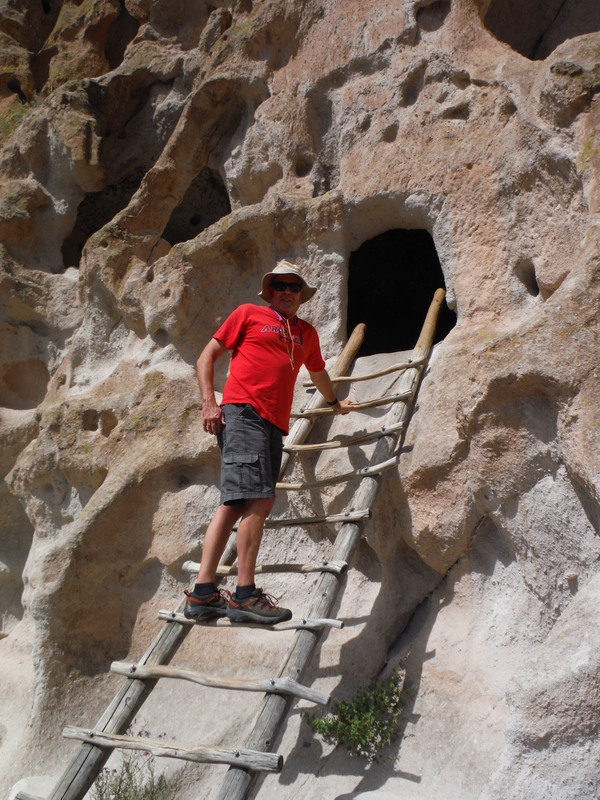 Bandelier National Monument is about two hours from Albuquerque, New Mexico. The entire monument is much larger than the valley, however, and has 70 miles of trails for backpacking and hiking. 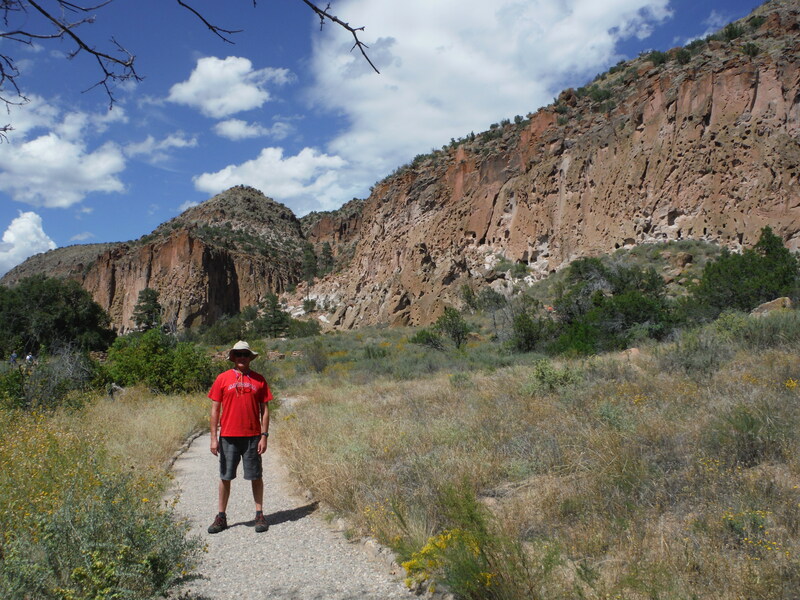 So whether you are interested in the ancient culture, or want to get out into nature via backpacking, Bandelier offers both. 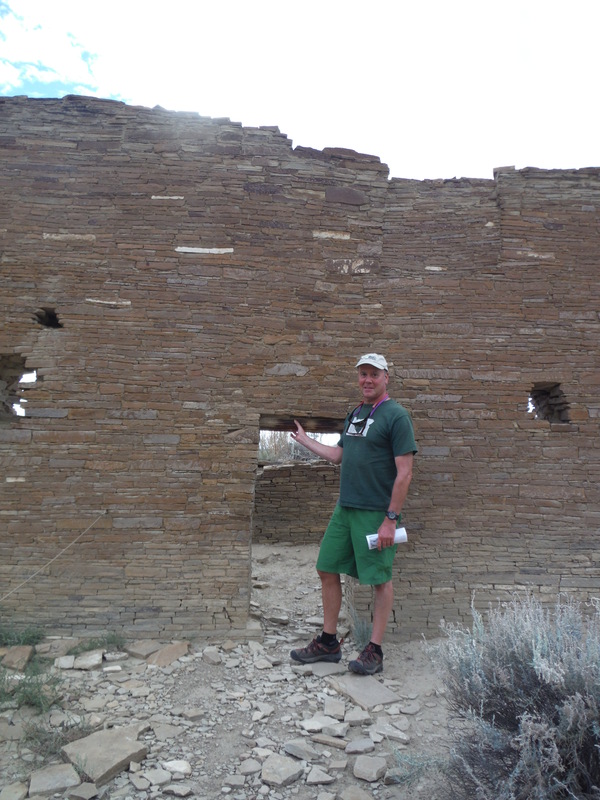 In the next blog post I’ll cover Chaco Canyon! 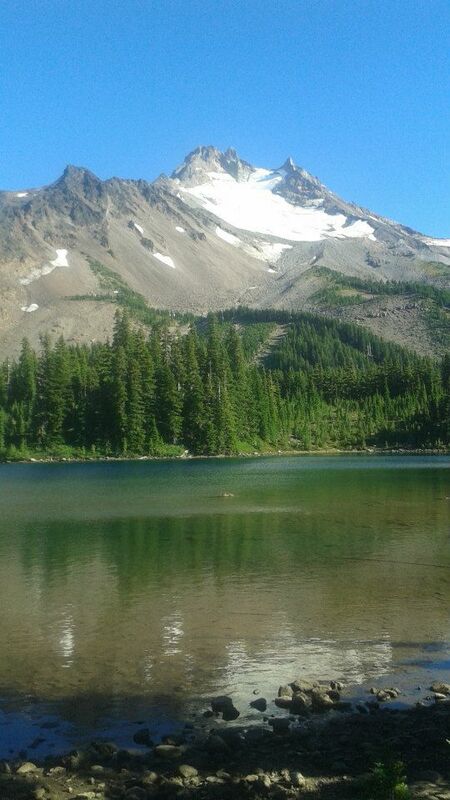 Russell Lake – Mt Jefferson fills the sky! One of Oregon’s wonders is Jefferson Park, and Laura and I recently hiked the Whitewater Ridge Trail to spend a couple of Eden-like days in its splendor! A dormant 10,495ft high volcano, Mt. 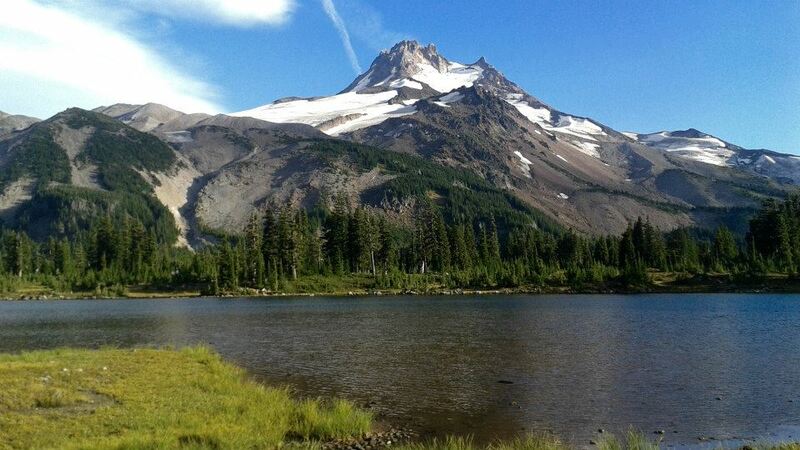 Jefferson is Oregon’s 2nd highest peak. It sports five glaciers. And sitting just below its northeast side is Jefferson Park – a square mile plateau sprinkled with wildflower meadows and brilliant lakes. 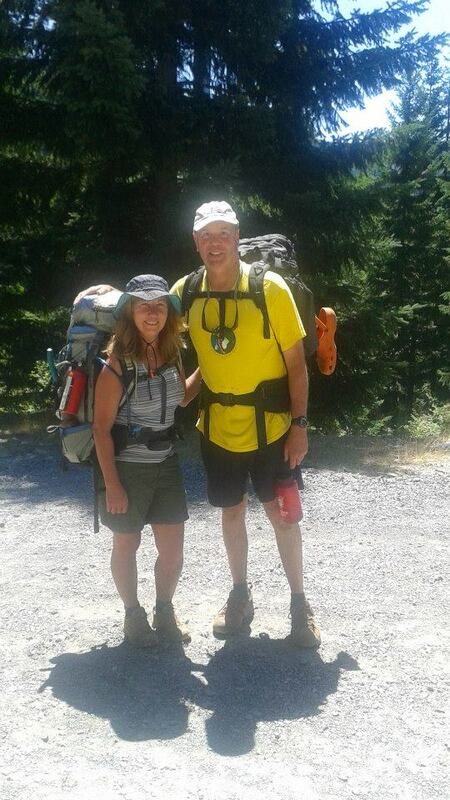 Laura and I backpacked about six miles up 1,800 vertical feet up the Whitewater Ridge Trail to reach it. The day we hiked, it was 85 degrees at the trailhead. Much of the route is exposed to the sun – with beautiful views, but on our day the heat and effort were what dominated our trip up. Now we just need to find a campsite! Bays Lake – Dive Right In! 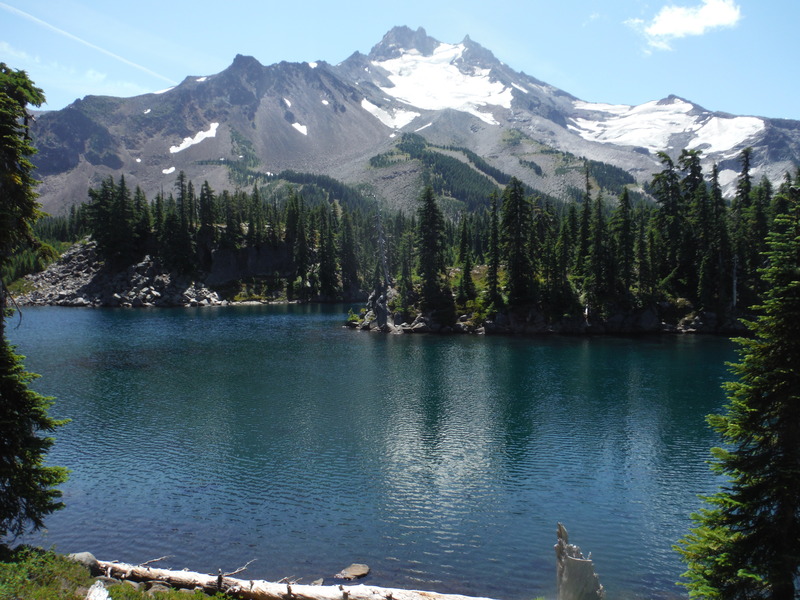 Jefferson Park is a protected area within the Mt Jefferson Wilderness, and there are maybe two dozen designated campsites throughout. It’s very popular so some of it has been marked off limits for the land to recover. 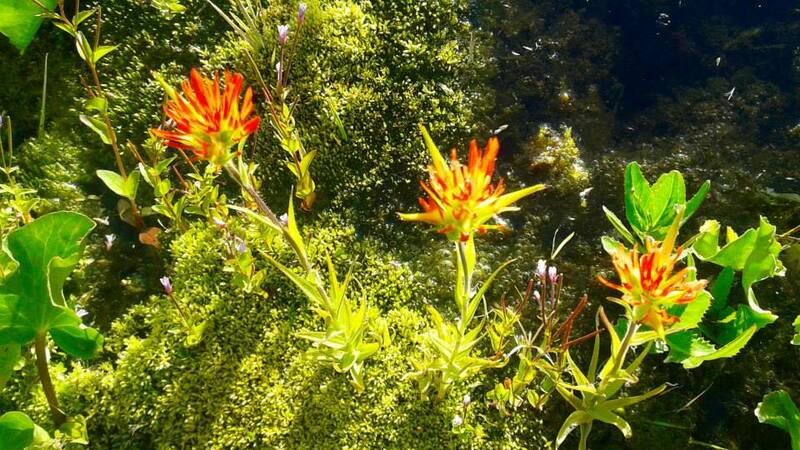 It’s all alpine flora, which is super delicate. We’re trying to find my old favorite spot on Bays Lake. But it’s occupied, so we opt for a spot on Scout Lake. We’ve got nothing to complain about with our view. And Laura has no problems settling into the routine. Before long she’s relaxing reading a book on Tibetan Buddhism in the fading afternoon sun. We take a bit of time to explore the plateau. We head north up to the Russell Lake area. It’s a ways but worth the effort. We decide to return there the following day. There are not many wildflowers as times I have been here before, because in 2015 we have a severe drought. The wildflower season came very early. 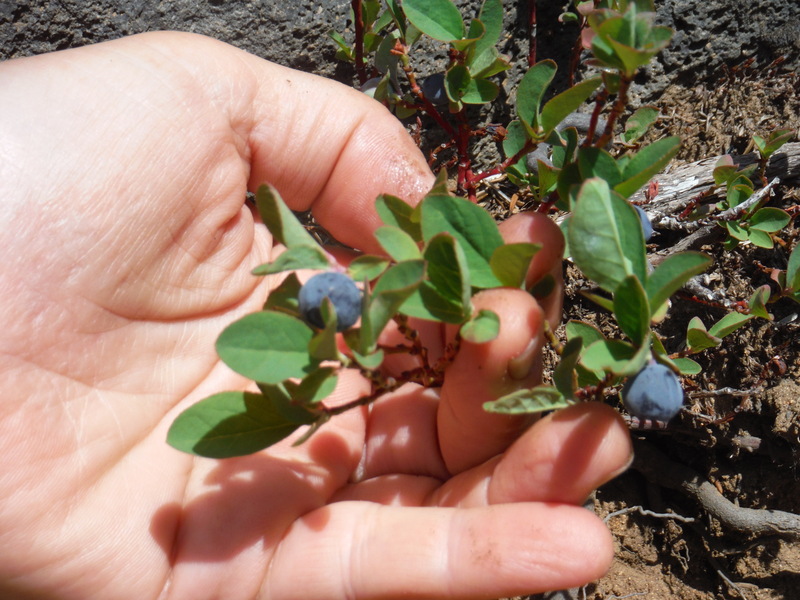 But on the other hand, huckleberries are everywhere! We collect huckleberries for breakfast. These will be good at breakfast! Then it was back to camp for dinner. I brought a quick fix rice side and blended it with cooked chicken. It looked huge but I ate all of it. Laura had simple cheese, crackers and some meat like sausage. It was a beautiful evening. Starry and windless. I slept very well. I awoke to a rosy dawn, and made hot water for coffee or tea. Those huckleberries went well with my oats and yogurt. Hunger satisfied, we headed out for an exploratory hike checking out the area, and the first destination was Russell Lake. It’s about a mile north from our camp at Scout Lake, a completely flat trail meandering along the meadows, passing through islands of trees. We could see that a few weeks earlier it was a carpet of wildflowers everywhere. Once we reached Russell Lake, we took a trail around the lake. We encountered campers, everyone gushing about how beautiful this place is. It was on the northern fringe of the lake where we found a micro-zone ecosystem with a view to knock our socks off. 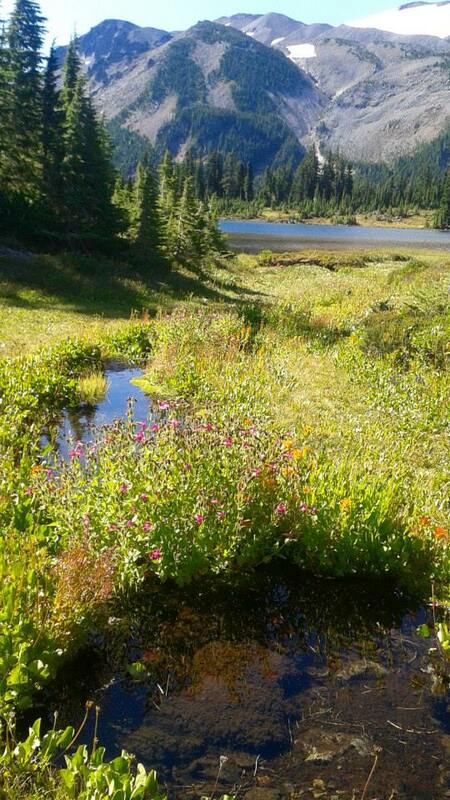 There, a three-foot-wide stream meanders across the meadow before entering Russell Lake. 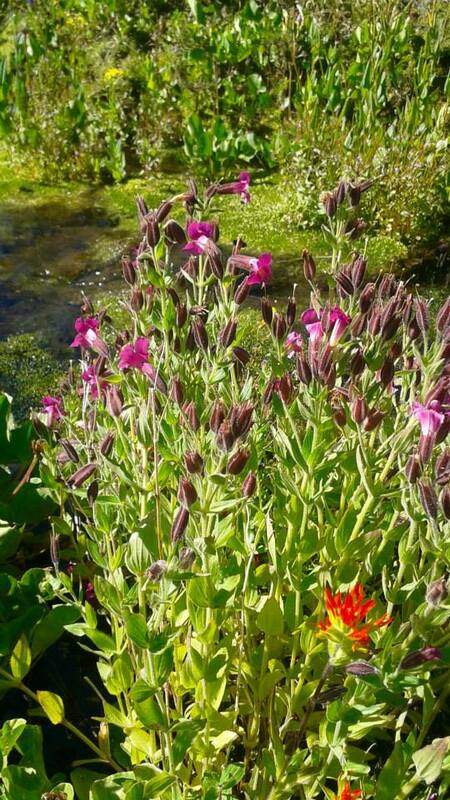 It wets the soil enough to allow wildflowers to continue blooming along its path. And in the stream, we glimpsed frogs and minnows. There was Indian Paintbrush, Lupine and several other species of wildflowers I couldn’t identify. We spent a half hour taking pictures and examining this micro eco system. It was so profound that just a bit of extra moisture kept this area lush with life, with an extended season, long after other parts of the meadows had gone to seed. Later, we headed over to Bays Lake for a swim. Bays lake has lots of boulders and it’s deep. We dove in and swam across, back and forth, revelling in the warm water and the beauty! We both decided to bring more friends up here in the future. It’s too beatiful and it’s got to be shared! Following the evening meal another rock solid sleep. The following morning, it was time to head out. The trail now would be all down, much faster and easier. We passed by several groups, pretty diverse! Some retirees, and I swear a lady over 80. And three kids, followed 5-minutes later by mom toting an Everest expedition sized 70 pound pack for all of them! Cheers for her! Well, here is a victory photo. A trip well done! We’ll be back.